Did you ever see a UFO? Or something else that seemed out of this world or unexplainable? Now you can share you story with the world and hear other people experiences with True Tales Of The Paranormal. Get it now for the best true ghost, ufo, and other real mysterious stories. 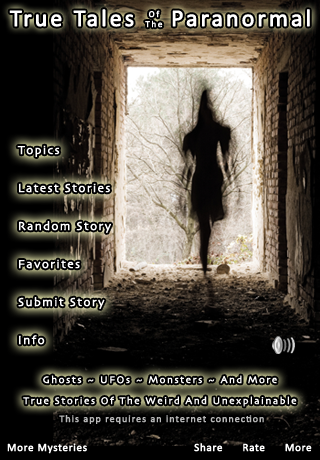 Read Real Paranormal Stories From Users Around The World and Share your own stories! Great App! - Love this app! Not only interesting to read other folks' stories but I can send in my own with ease. If you like the paranormal then you'll love this great little app! AMAZING! - I believe in everything paranormal and all these stories blew me away! Paranormal - Interesting to hear about others experiences.